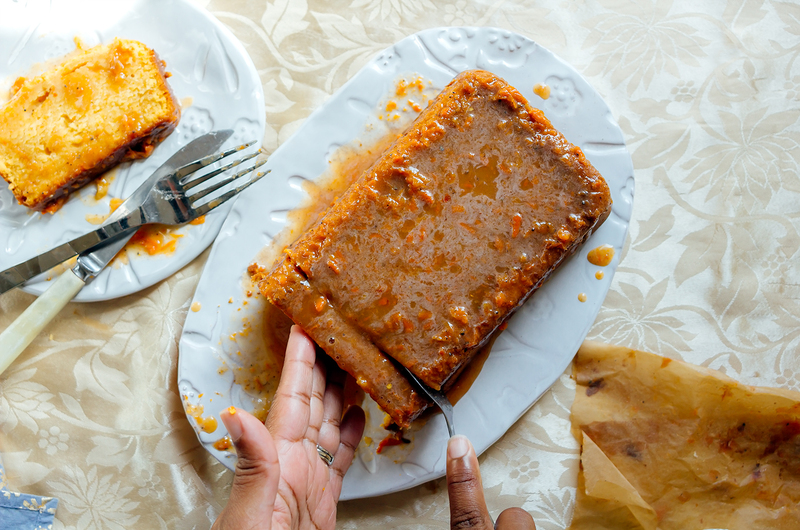 Here’s the humble and mighty pound cake, with flecks of brilliant orange sweet potato brightening this simple dessert. I use this cake recipe all the time. Zero baking soda or powder in the batter — believe me everything will rise perfectly. The natural sweetness of the tuber adds an additional sugary layer. The spicy and fragrant icing provides the silent punch. I like to make a double batch so we can eat one and freeze the other — do it and you’ll be glad you did. To make the glaze, combine the dairy, sugar, ground spices and mashed potato using a whisk. Set aside. Preheat the oven to 325 degrees F. Butter and flour a 6-x-9-3/4-inch loaf pan (flour well and shake out excess). Set aside. Using a stand or hand mixer, cream 1 cup of butter and cream cheese. Gradually add sugar and beat until fluffy. Slowly add the eggs (one at a time). Add sweet potatoes. In stages, incorporate 3 cups of the flour, but do not overbeat. Stir vanilla into the mixture (the batter will be thick). Transfer into the pans. Cook for around 1-1/2 hours. Use the toothpick method to test doneness (place a toothpick in the center of the cake; if no batter sticks, it means the cake is done). Transfer the cakes to a cooling rack and let them cool in the cake pan. Loosen the cakes by running a butter knife around the edges of the pans. Carefully turn out the cakes on a cake stand or plate. Pour glaze over the cakes and let set for an hour. Note: Vanilla paste has a thicker consistency with specks of vanilla and a deeper flavor.